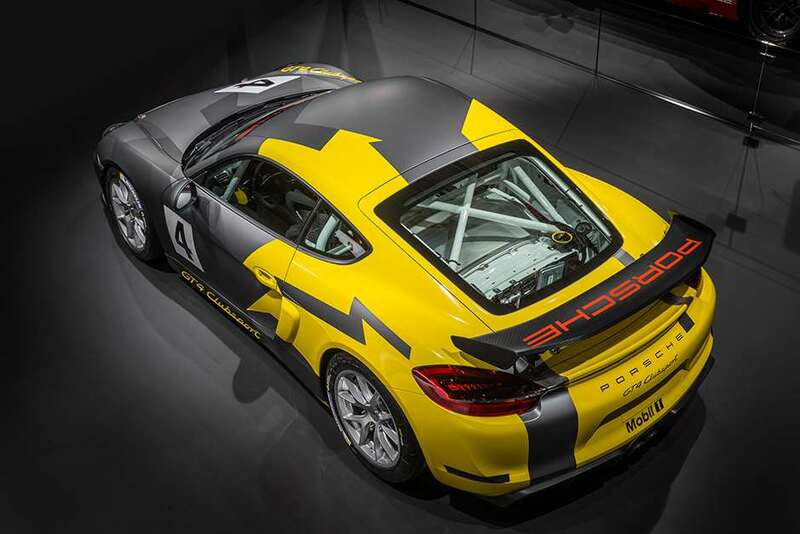 The new Clubsport race-only version of the already acclaimed Cayman GT4 road car – one of the stars of the Los Angeles Auto Show this week – will come ready to race straight out of the box when deliveries start next year. Ordered from Porsche Motorsport in Weissach, Porsche’s latest track weapon will cost €111,000 (about £77,750) plus the VAT. Porsche says it will come homologated for race series such as the VLN endurance series at the Nürburgring, SRO’s GT4 series, the Pirelli GT3 Cup Trophy USA and for club-level meetings around the world. That’s the boring stuff out of the way – now the exciting bit. As GRR has already reported, the Cayman GT4 Clubsport takes a load of Porsche’s very best bits and plenty of junior-level racing focus to elevate the GT4 road car into a machine made for the track. And, also – as Porsche says – made for motorsport newcomers. The car weighs 1,300kg and has 380bhp from its 3.8-litre flat six. The engine is the same as the road car’s but the transmission certainly isn’t: there’s no manual box in this GT4, just a six-speed PDK double-clutch transmission with paddle-shift. Like the road car there’s a proper mechanical locking diff at the back. The suspension is taken from the 911 GT3 Cup car, with bespoke settings for the racer. The brakes are steel but big: 380mm all round with six-pot calipers up front. The anti-lock brake system can be adjusted in 12 stages and the electronic stability programme has been calibrated to work with slicks. 18-inch five-bolt forged rims sit at each corner, shod with Michelin tyres: 25/64-18 front, 27/68-18 rear. There’s no passenger seat and no trim, but there is a welded-in roll cage, racing bucket seat, six-point harness and a choice between 70, 90 or 100-litre safety fuel tanks. Being a particularly sweet-handling road car underneath won’t automatically make it a winner on the track, in the Los Angeles show yellow-and-grey with racing numbers and logos, it’ll look the part on the grid. We reckon it will act the part, too.